Agromyza mobilis Meigen, 1830; Spencer, 1976. Fauna ent. Scand. 5(1): 123, figs 206-7. Agromyza mobilis Meigen, 1830; Spencer, 1990. Host specialization in the world Agromyzidae (Diptera) : 356, 359. Leaf-mine: Long upper-surface corridor usually containing several larvae that graze shoulder to shoulder from the leaf tip downwards. Pupation outside the mine. Mines and larvae are indistinguishable from those of A. nigrella (Bladmineerders van Europa). 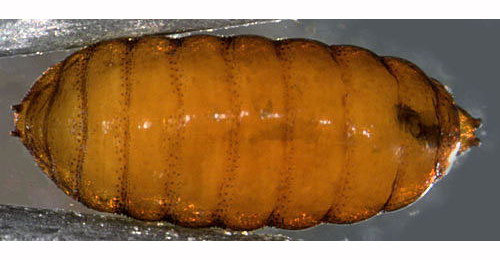 Larval mandibles with two teeth; posterior spiracles far apart (Bladmineerders van Europa). Distribution in Great Britain and Ireland: Widespread in Britain including Derby (Miller's Dale), Stafford (Newcastle-under-Lyme), Northumb. (Wooler), Yorkshire (Burely in Wharfedale), Perth (Spencer, 1972b: 33); Warwickshire (Brinklow) (Robbins, 1991: 135) and Anglesey, Cambridgeshire, Cardiganshire, Carmarthenshire, Denbighshire, East Norfolk, East Suffolk, Elgin, Glamorgan, Huntingdonshire, Middlesex, North Devon, North Hampshire, North-east Yorkshire, Nottinghamshire, Oxfordshire, Pembrokeshire, South-east Yorkshire, South-west Yorkshire, Stafford, Surrey and West Norfolk (NBN Atlas). Distribution elsewhere: Widespread and common in continental Europe including Denmark, Finland, Norway, Sweden, Holland, Italy (Spencer, 1976: 123), Belgium (Scheirs, de Bruyn and von Tschirnhaus, 1996), Germany (Spencer, 1976: 546), Czech Republic, Estonia, French mainland, Hungary, Latvia, Lithuania, Poland, Slovakia, Spanish mainland, Sweden and Switzerland (Martinez in Fauna Europaea). Also recorded in Japan by Sasakawa (1961), although the accompanying illustration of the genitalia suggests that a [different but] closely related species is involved (Spencer, 1990).